I am huge fan of Amy Reichert. Her stories weave food throughout them, and I am always hungry while reading her books. I picked up The Coincidence of Coconut Cake last year and adored it. Then I read The Simplicity of Cider earlier this year and really enjoyed it. 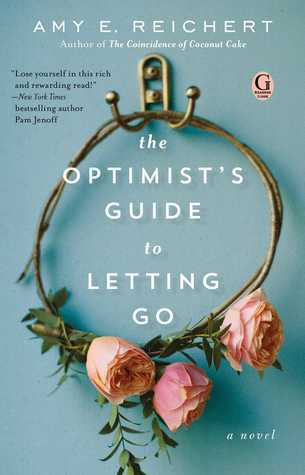 I won a Goodreads Giveaway copy of her newest novel, The Optimist’s Guide to Letting Go, from Gallery Books before the book released and finally had a chance to read it this week. The Optimist’s Guide to Letting Go follows Gina, her daughter May, and her mother Lorraine over the course of one week. When Lorraine suffers a stroke, these three are thrown for a loop, and family secrets are about to unravel. Gina runs a gourmet grilled cheese food truck called Grilled G’s, which I need in my life. Her husband Drew bought the truck and fixed it up for her before he passed away two years ago. Her daughter May is struggling with her grief and kind of hates her mom right now. Gina is trying her best to connect with May, but it doesn’t help when she goes to check on her mother Lorraine. Lorraine and her daughters Gina and Vicky have a very complex relationship. Her daughters don’t understand her and at times really don't like Lorraine, but things change when Gina and Vicky find out that Lorraine has been hiding a secret from them for years. This secret affects the whole family and causes a lot of self-reflection for everyone. I have always been a sucker for multi-generational stories, but this one is probably the most condensed I have ever read. The story takes place over a week, but flashes back to different times to give context. I like the short timeframe for this story because it means the drama cannot drag out indefinitely. And I really just wanted these women to be happy and have healthy family relationships. As the story goes on, we see so much of Lorraine in Gina, which is crazy considering how different they are at the beginning of the book. Lorraine is an incredibly complex woman, and I was unsure if and how she would redeem herself by the end of the book. But learning more of her backstory and her choices helped shape her character. I still think she could have made better decisions, especially when it came to Gina and Drew’s relationship, but she was incredibly compelling. Gina is the eternal optimist, but lately she has been really struggling with her life. She and Drew had a storybook romance and marriage and in the last two years since he died, she finds it harder to connect with May and deal with her mom. May is not only a typical angsty teenager, but on top of all the teenage hormones, she has not come to terms with her dad’s death. They had a very special relationship, and when Gina doesn’t want to discuss Drew, May begins to resent Gina for ignoring their memories of Drew. Reichert explores how daughters don't automatically think of mothers as someone other than a mom. So often, children only see their parents as parents, and not people who have lives outside of their children. May and Gina both struggle with this, and it is so refreshing to see the change in perspective by the end of the book and how that change helps save their relationships. As I have said before, I love books about food, and I think Amy Reichert is one of the best at combining good stories while incorporating food as a secondary character. I want to find a real-world Grilled G’s food truck and eat there every day. Grilled cheeses are my favorite comfort food, so this was such a delightful addition to The Optimist’s Guide to Letting Go. If you are looking for family fiction or fun foodie reads, I cannot recommend Amy Reichert’s books enough. I still have one more Reichert novel to read, Luck, Love and Lemon Pie, and I'm sure I will enjoy it just as much as her other books. The Optimist’s Guide to Letting Go is a delightful read. I give it 4 stars. Now if you’ll excuse me, I’m going to go make a grilled cheese. What other authors do you swear by all their books?